Stephen has been a professional artists for more than 20 years. During this time he has worked in many media, developing public art schemes and fulfilling private commissions. 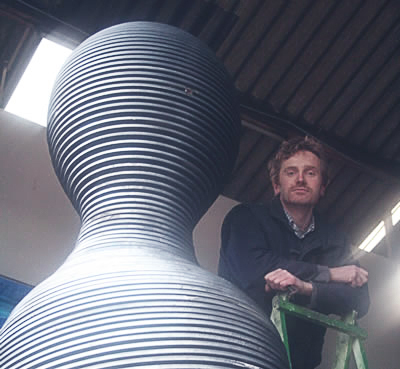 His work is informed by a deep sense of place and time born of his upbringing on a Lancashire farm, as well as a passion for exploring the properties of materials and the possibilities they hold within. In 1996 he established Scartworks ltd. a company dedicated to creating high quality public artwork for a wide range of clients. To date Scartworks has successfully designed and realised over 100 commissions throughout the UK. It also became apparent that there was a growing need in the North West for a company that could provided advice and expertise to other professional artists, helping them to create and install artworks that were beyond their capabilities or scale. Scartworks is a creative company which specialises in the production of artwork for public spaces. Past clients include both large corporate and public bodies as well as other artists and designers. Recent projects include: sculptures; street furniture; gateways; floor and wallscapes in mosaics: architectural ceramics. Our driving force always remains the same – to create innovative works of art built from durable materials to a high standard of craftsmanship. We have extensive experience of working with architects, local authorities, planners and engineers to produce work to commission. Consultation with community groups and local organisations has also become a central feature of our practice “ enabling them to play an active role in the creative process. We pride ourselves on being able to provide a complete design & realisation service.